Our treasured copy of this two-LP classic is once again being shared among the young married couples in our family. There's a used copy available on Amazon today for $45 ... that means ours has gained 4500% in value since I bought it for 99¢ at Sam Goody forty years ago! I picked this up from the Ninety-Nine Cent bin at Sam Goody in 1973. Gave it to one of my cousins at his wedding. The nervous couple really appreciated my thoughtful gift. After all, who would know more about what to do on your wedding night than a member of the clergy who has taken a vow of celibacy? This treasure-trove of excellent information was passed among the cousins as we each became married. I moved across the country and was married in a small private ceremony. Imagine my elation when the postman delivered a twelve-inch-square package that contained the venerable Catholic Marriage Manual recording. That was in 1981. An enclosed gift note said that the record album was valuable not because of its content, but because it "gives shape to the aluminum foil it is wrapped with". I totally concur with that observation. If you need a square piece of aluminum foil, this LP album is a perfect tool. "The Catholic Marriage Manual" was lost among hundreds of other vinyl LP's in our collection until shared with a great-neice who was married in 2010. We live in confusing times, but the timeless advice of Monsignor Kelly has enabled that couple to live in blissful harmony for more than TWO YEARS! 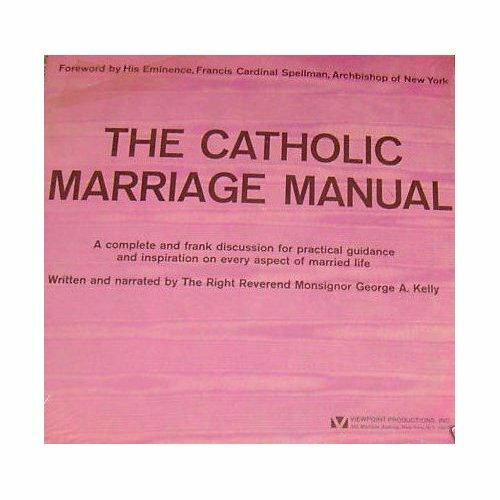 Obviously, "The Catholic Marriage Manual" is an essential and much-appreciated wedding gift. Audio buffs will appreciate the fidelity of the original vinyl's LP quality. Speaking of fidelity, Msgr. Kelly eloquently addresses that topic in Chapter 13: "Until Death Do Us Part". Kelly is an impressive orator. Having "been there" but not having "done that", he also expertly preaches what he doesn't practice in Chapter 4: "Birth Control and the Rhythm Method". I've given this a ***** FIVE STAR ***** review. Even if I didn't flunk Latin, I couldn't offer praise from a higher place than Francis Cardinal Spellman who has awarded his highly prized "Imprimatur". Congratulations Msgr. Kelly, this is an artistic masterpiece! You have certainly earned your ranking at #941,342 on Amazon's list of best-sellers.